An intriguing welterweight title fight where reigning champion Tyron Woodley defended his title against undefeated Darren Till in the main headliner of tonight’s UFC 228 event from the American Airlines Center in Dallas, Texas. Woodley (18-3-1 MMA) didn’t compete since UFC 214 in July of 2017 when he defeated Demian Maia via unanimous decision. “The Chosen One” extended his record to 5-0-1 over his past six showdowns which include a first-round knockout win over Robbie Lawler. Meanwhile, Darren Till (17-0-1 MMA) last fought in May at UFC Fight Night event in Liverpool where he won via controversial decision over former two-time title challenger Stephen Thompson. 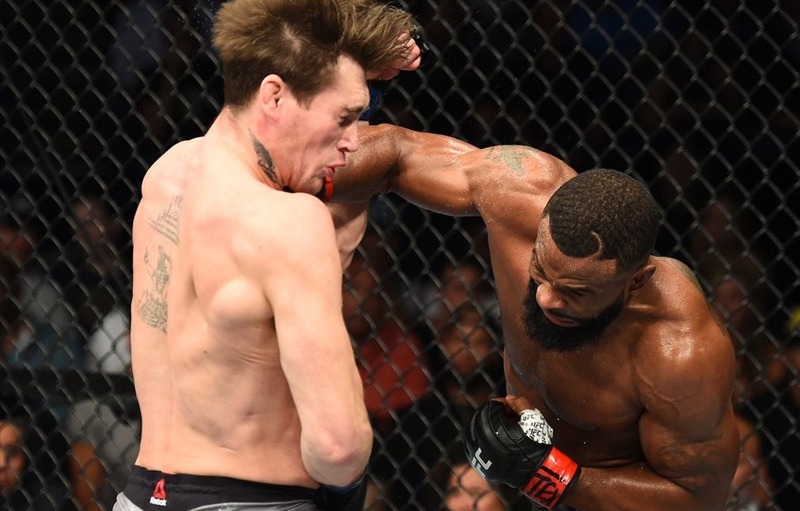 Woodley probably had the best performance to the date which he delivered tonight in the main headliner of UFC 228, after defeating Darren Till with a D’Arce choke. Woodley, who came out aggressive, throwing punches, and hunting for takedowns. Woodley locked Darren Till to the fence, and both battled for a position where ‘the Gorilla’ defended a takedown very well, referee Dan Miragliotta made curious decisions and separated them. Woodley tried for another takedown, but Till, make his way to the fence again and action stalled again. By the second frame, Woodley didn’t let the referee the interrupt the action. ‘The Chosen One’ took charge and dropped Till with a right hand to the face, then began to unleased with ferocious series of punches and elbows from top position. Woodley finds a right timing to secure the D’Arce and forcing ‘The Gorilla’ to tap for his first career defeat. After a great submission win, Woodley now 6-0-1 in his past seven. Darren Till showed some respect to Woodley and accepted his loss. OUT OF ST. LOUIS, USA! Next articleJessica Andrade Destroys Karolina Kowalkiewicz Via First-Round KO!